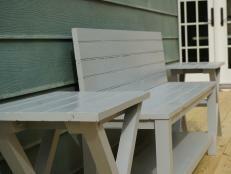 This outdoor bench project is a great way to show off your woodworking skills. 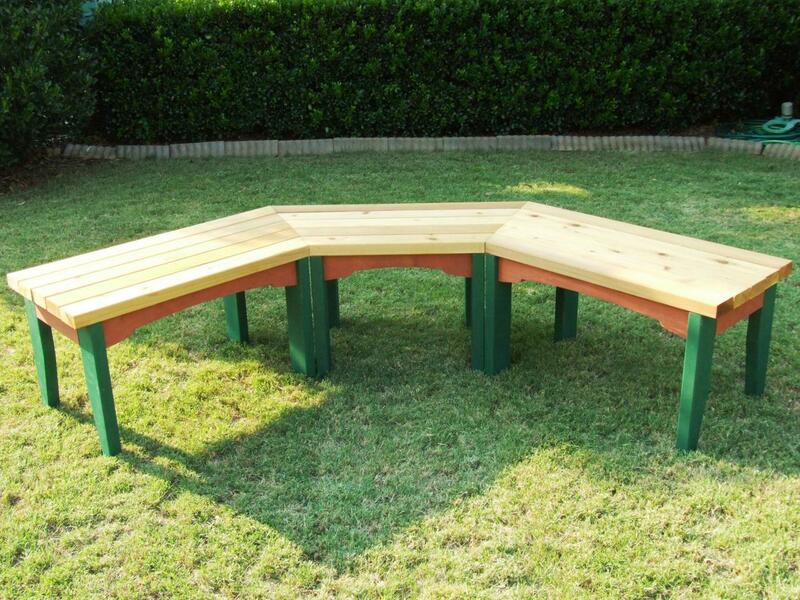 The bench is a perfect addition to a garden, deck or around a fire pit. This semi-circular wood bench is a great addition to a garden, deck or around a fire-pit. 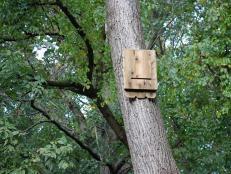 This project uses cedar, but redwood would work just as well. 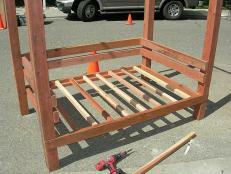 If you decide to use treated lumber, only make the base assemblies from it and use cedar or redwood for the seat slats. When buying lumber, look for pieces that are straight and have the fewest knots, especially knots that are on the edge of the board. Note that dimensional cedar (2x4s for example) may be more difficult to find at your local home improvement center or hardware store, so you may need to visit a lumber yard. 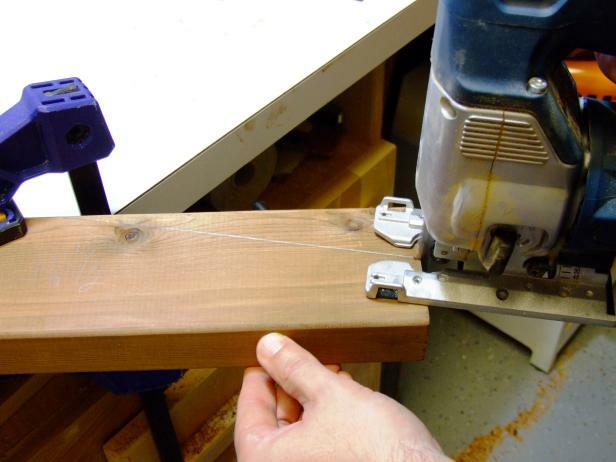 In any woodworking project, it's typically best to cut all parts for as you need them and not all at once. 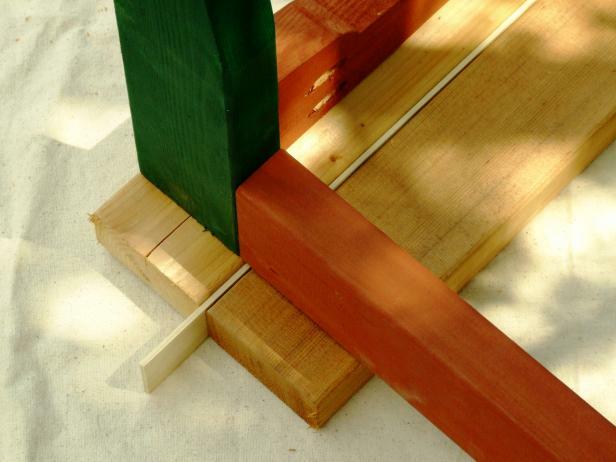 One small error can ruin an entire stack of lumber. This project uses pocket hole joinery in a few instances. 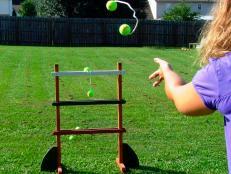 If you're not familiar with it, take a look at the basics in this DIY Network tutorial. End Legs – four at 1-1/2" x 3-1/2" x 16-1/2"
Legs – eight at 1-1/2" x 3-1/2" x 16-1/2"
Long Front Aprons – two at 1-1/2" x 3-1/2" x 25-1/2"
Short Front Apron –one at 1-1/2" x 3-1/2" x 18-1/8"
Long Back Aprons – two at 1-1/2" x 3-1/2" x 25-1/2"
Short Back Apron – one at 1-1/2" x 3-1/2" x 18-1/8"
End Aprons – six at 3/4" x 3-1/2" x 11"
Seat Braces – three at 1-1/2" x 1-1/2" x 13-1/2"
Outer Seat Slat 1– two at 1-1/2" x 3-1/2" x 31-1/2"
Inner Seat Slat 1 – two at 1-1/2" x 3-1/2" x 24"
Outer Seat Slat 2 – two at 1-1/2" x 3-1/2" x 33"
Inner Seat Slat 2 – one at 1-1/2" x 3-1/2" x 27"
Outer Seat Slat 3 – two at 1-1/2" x 3-1/2" x 34-1/2"
Inner Seat Slat 3 – one at 1-1/2" x 3-1/2" x 30"
Outer Seat Slat 4 – two at 1-1/2" x 3-1/2" x 36"
Inner Seat Slat 4 – one at 1-1/2" x 3-1/2" x 33"
Outer Seat Slat 5 – two at 1-1/2" x 3-1/2" x 37-1/2"
Inner Seat Slat 5 – one at 1-1/2" x 3-1/2" x 36"
Measure the dimensions of the outer legs and cut them. Two legs will be used on the outer ends of your bench. Cut the outer legs. Two will be used on each outer end of the bench (the base assembly). Then cut the inner legs, refer to the dimensions in the cut list. Cut the outer legs. Two will be used on each outer end of the bench (the base assembly). Follow the layout in Image 1. Then cut the inner legs, refer to the dimensions in the cut list. 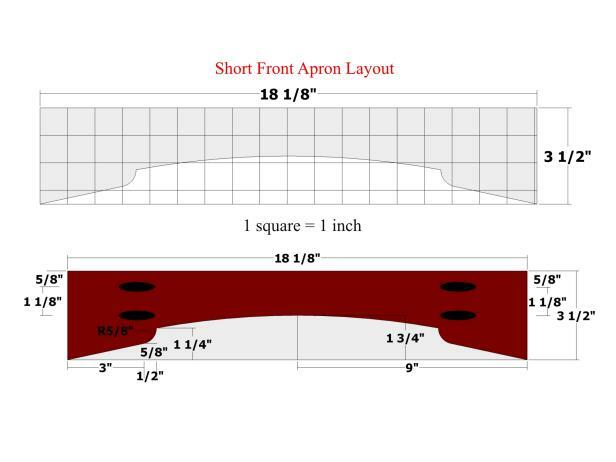 Follow the dimensions below to create the aprons that will hold your bench legs together. 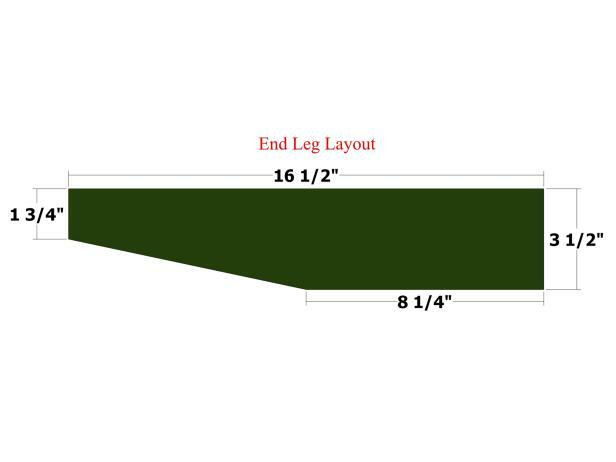 Use the cut list to measure and cut the legs for your bench. Use a half-dollar coin or something of a comparable size to cut the radii on the inside corners of the front aprons. 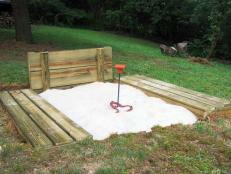 See it at diynetwork.com. Set the pocket-hole jig and drill bit for drilling into 1 1/2 inch stock and drill the pocket holes in the front aprons. 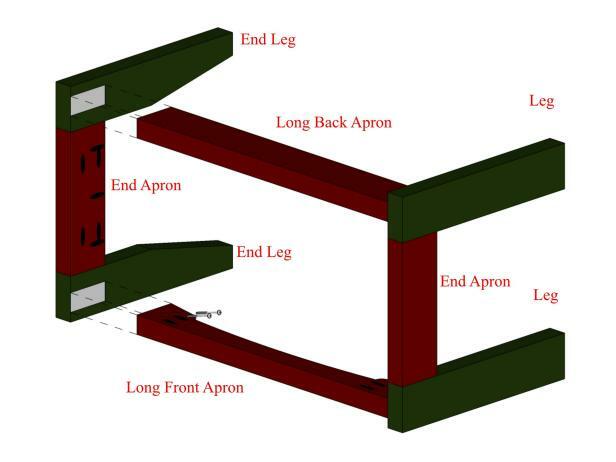 The aprons are rails used to connect the legs and support the seat. Use the layouts in Image 1 and Image 2 (below) to create the long and short front aprons. 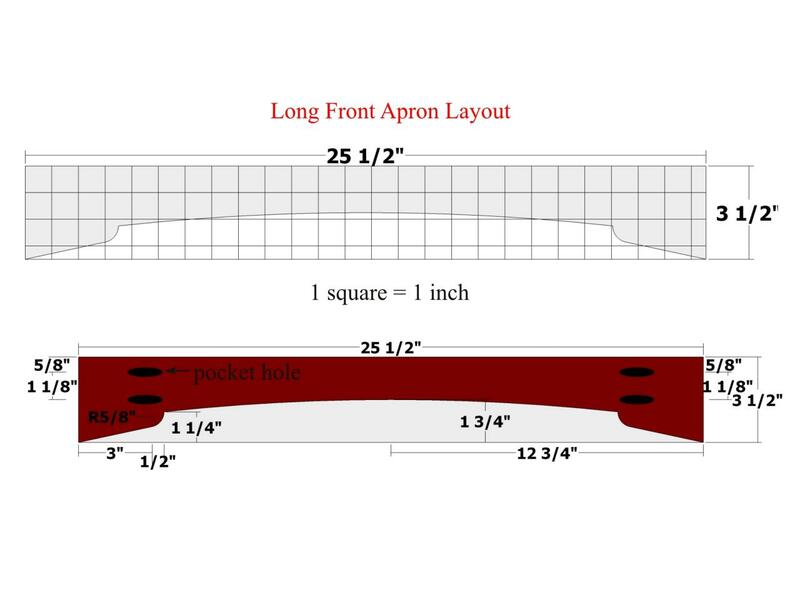 Refer to the cut list above for the exact sizes of the aprons. 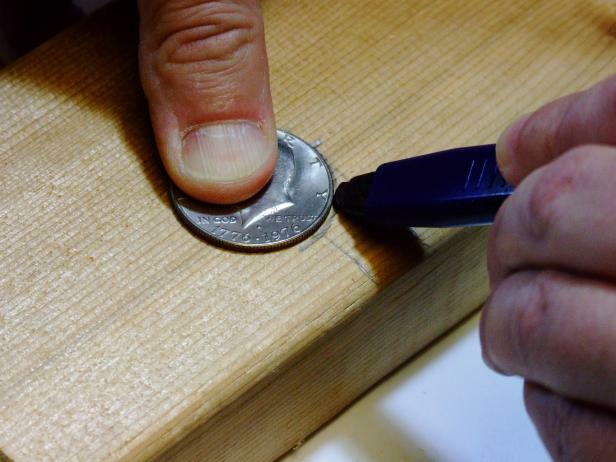 To cut the radii on the inside corners of the front aprons, use a half-dollar coin or something of similar size (Image 3). 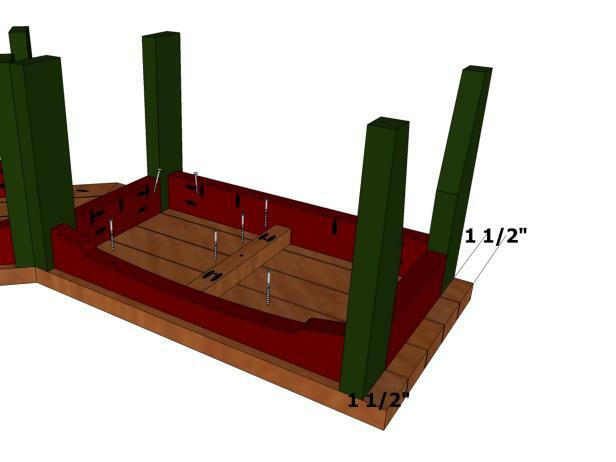 For marking the top arc, use a thin strip of wood or a flexible metal ruler. 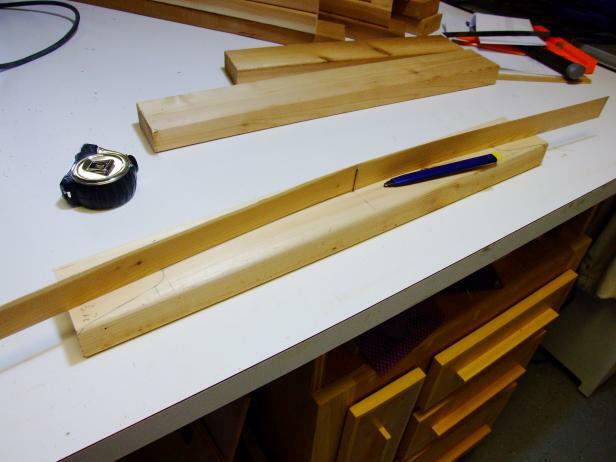 Drive in nails or brads to hold the wood strip or ruler in place while marking (Image 4). Use a jigsaw to cut the front apron pieces to shape. 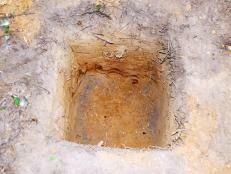 Drill pocket holes in the front aprons as marked in Images 1 and 2. 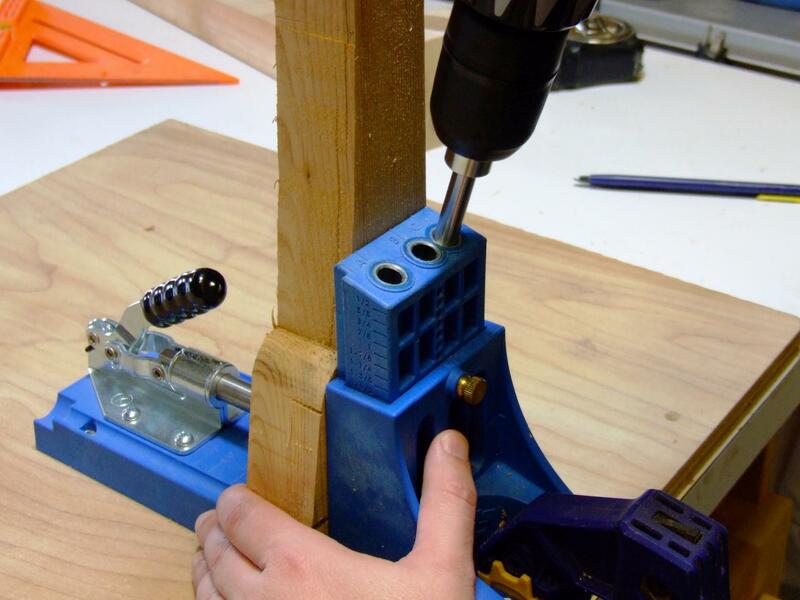 Set the pocket-hole jig and drill bit for drilling into 1-1/2-inch stock (Image 5). Cut the long and short back apron pieces. Refer to the cut list above for the exact sizes. Drill pocket holes in the long and short back aprons as marked in Image 6. Cut the end apron pieces to size. Again, refer to the cut list for exact dimensions. Apply the finish to the aprons and legs prior to assembly. We used Cabot Solid Color Acrylic Siding Stain (Evergreen) on the legs, and Cabot Solid Color Acrylic Siding Stain (Redwood) on the aprons. 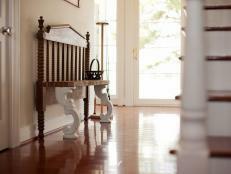 This finish acts as a primer/sealer and top coat in one. To make a brace between your bench legs, position an end apron flush against two legs. Position an end apron flush against two legs and attach using glue and 2-1/2" pocket-hole screws. Position the long back apron and long front apron flush against the end apron assemblies and attach using glue and 2-1/2" pocket-hole screws. Place a scrap piece of 1-by material (3/4-inch thick) underneath the short front apron and positioned flush against two end apron assemblies and attach using glue and 2-1/2" pocket-hole screws. Attach the braces to your bench legs by using pocket hole screws to secure the seat. 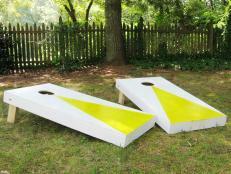 Position an end apron flush against two legs (Image 1) and attach using glue and 2-1/2" pocket-hole screws. Build two assemblies. Position the short back apron flush against the end apron assemblies and attach using glue and 2-1/2" pocket-hole screws. 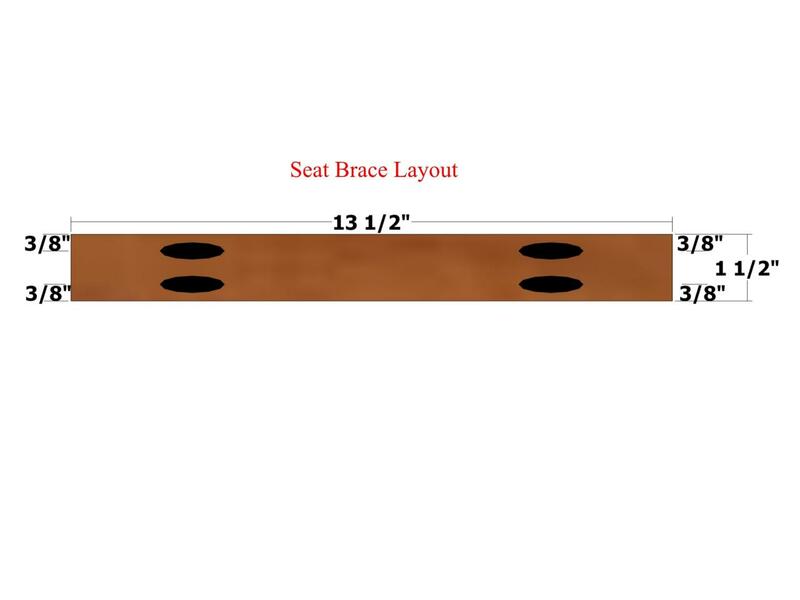 Check the cut list and then measure and cut the braces for your seats. 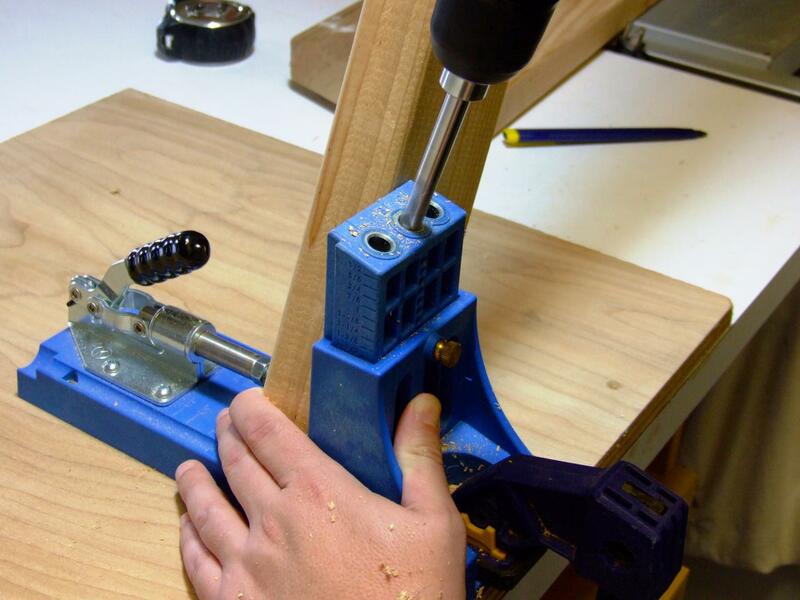 Once the braces have been cut, drill pocket holes in the seat braces for further securing. After you've cut the seat brace, position it in the center of the seat, flush agains the top of the short front apron and short back apron. Position a seat brace centered and flush against the top of the short front apron and the short back apron and attach using glue and a 2 1/2" pocket-hole screws. Cut the seat braces, check the cut list for size. 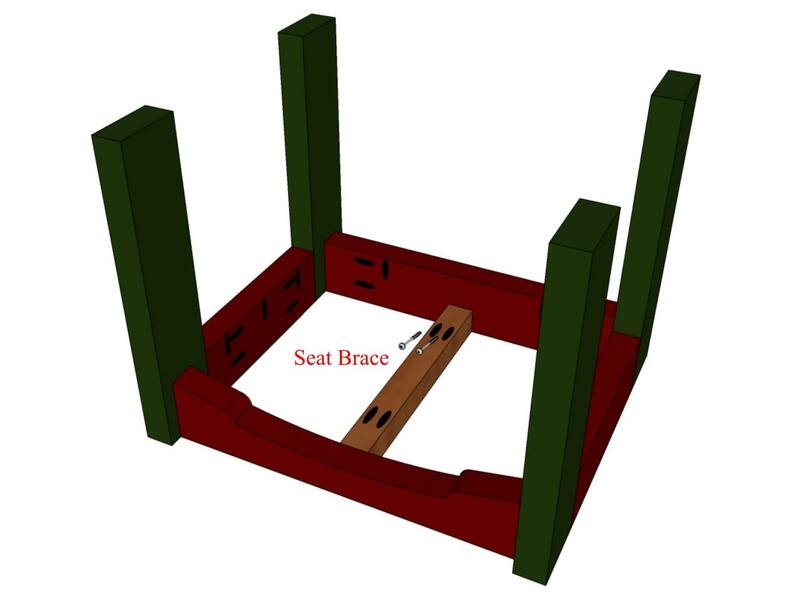 Drill pocket holes in the seat braces as shown in Image 1 (below). Position a seat brace centered and flush against the top of the short front apron and short back apron (Image 2) and attach using glue and 2-1/2" pocket-hole screws (Image 3). 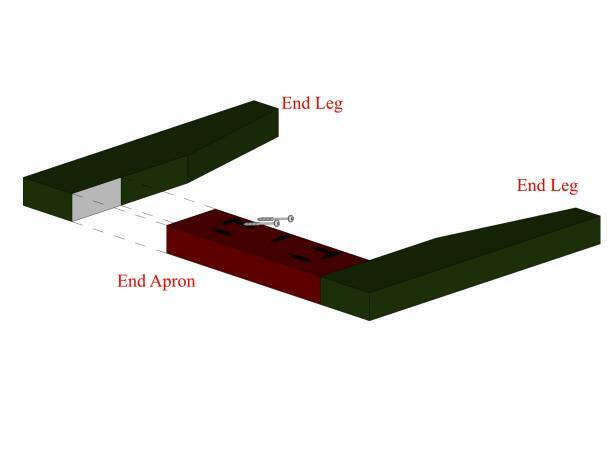 Note: In this next step, you'll be creating two assemblies that are mirror images of each other, with the end leg assembly positioned on the outside of the two long front apron assemblies. 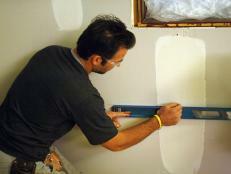 Position an end apron flush against two end legs (Image 4) and attach using glue and 2-1/2" pocket-hole screws. Build two assemblies. 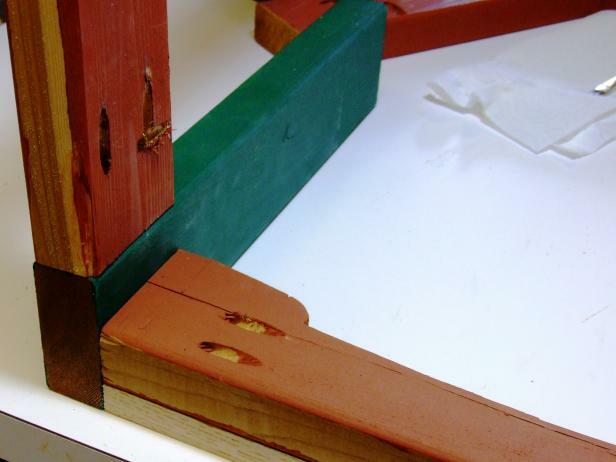 Place a scrap piece of 1-by material (3/4-inch thick) underneath the long front apron and positioned flush against one end apron assembly and one end leg/end apron assembly (Image 5) and attach using glue and 2-1/2" pocket-hole screws. Position the short back apron flush against the end apron assemblies as shown in Image 5, and attach using glue and 2-1/2" pocket-hole screws. On both assemblies, position a seat brace centered and flush against the top of the long front apron and long back apron and attach using glue and 2-1/2" pocket-hole screws. 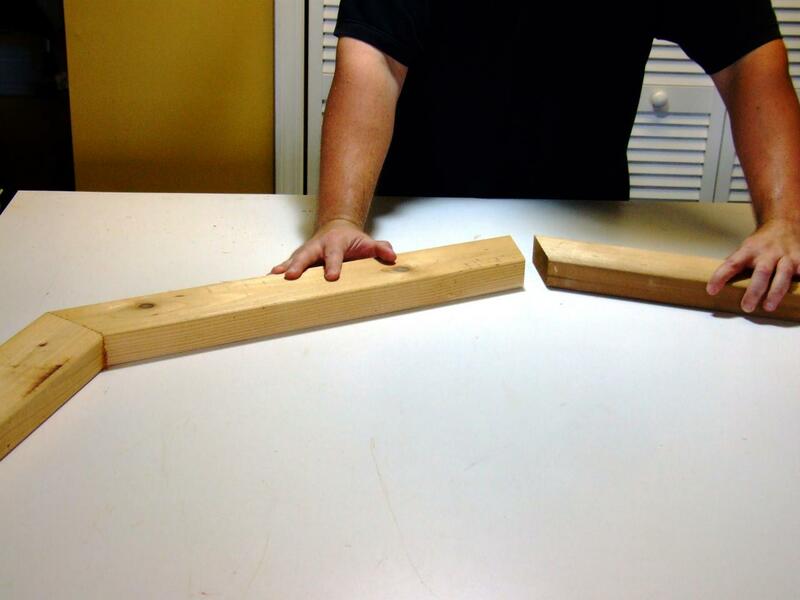 Use 22.5 degree angle cuts for each piece, and then dry fit the sized boards on a work surface. Once you have cut the seat slats, dry fit them on a level work surface to ensure they will rest securely. 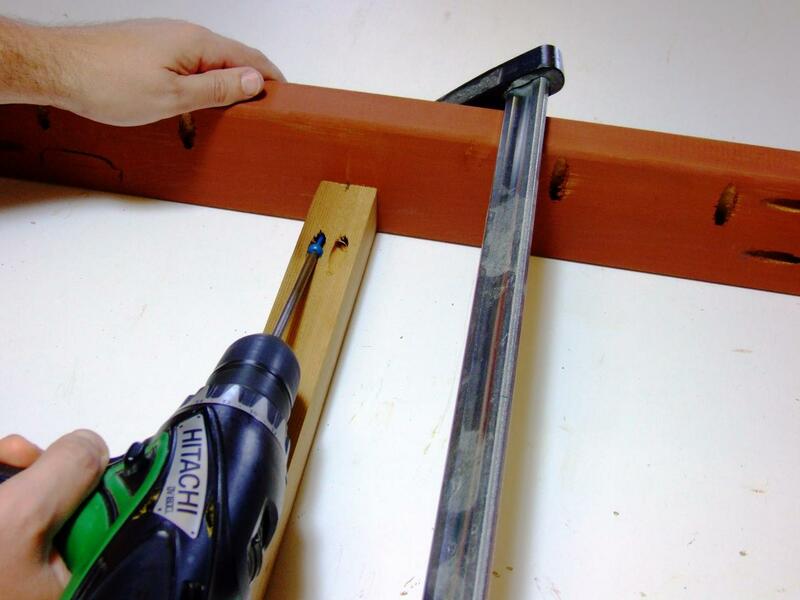 Set the pocket-hole jig and drill bit for drilling into 1-1/2-inch stock. Position the outer seat slats flush with the inner seat flat according to the diagram. Refer to the cut list on page 1for measurements on the seat slats. 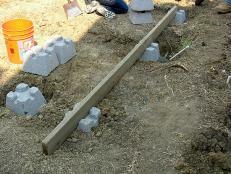 Refer to Image 1 (below) to see the 22.5-degree angle cuts for each piece. Dry fit them on a work surface. Drill pocket holes in the seat slats as marked in Image 1. Be sure to select the best-looking (least amount of defects) face of each board to be positioned up and drill the pocket holes on the opposite face. Position the outer seat slats 1 flush against the inner seat slat 1 as shown in Image 4 (below) and attach using glue and 2-1/2" pocket-hole screws. Position the outer seat slats 2 flush against the inner seat slat 2 and attach using glue and 2-1/2" pocket-hole screws. Position the outer seat slats 3 flush against the inner seat slat 3 and attach using glue and 2-1/2" pocket-hole screws. Position the outer seat slats 4 flush against the inner seat slat 4 and attach using glue and 2-1/2" pocket-hole screws. Position the outer seat slats 5 flush against the inner seat slat 5 and attach using glue and 2-1/2" pocket-hole screws. Attach the base assembly side rails and back rails to the innermost and outermost seat slats using 2-1/2" pocket-hole screws only. 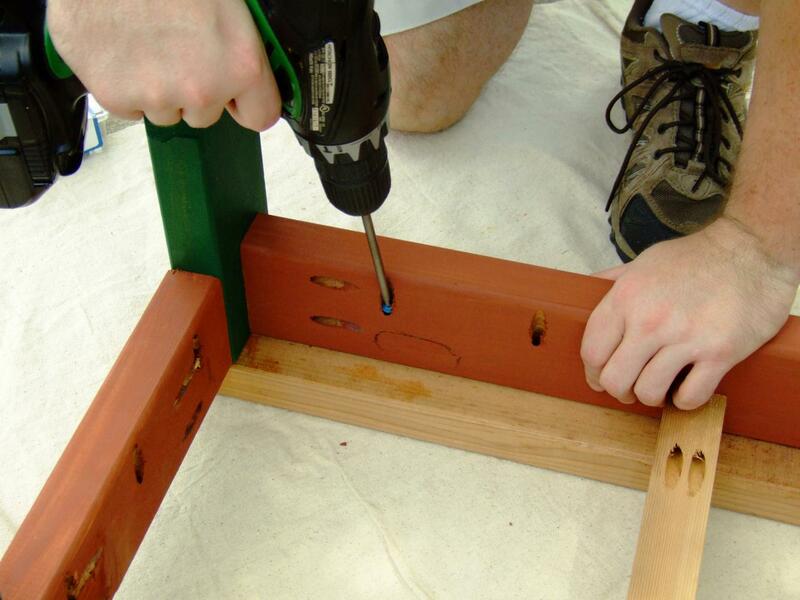 Make the base sturdy by drilling countersunk pilot holes in the front rails and seat braces of the base assemblies. 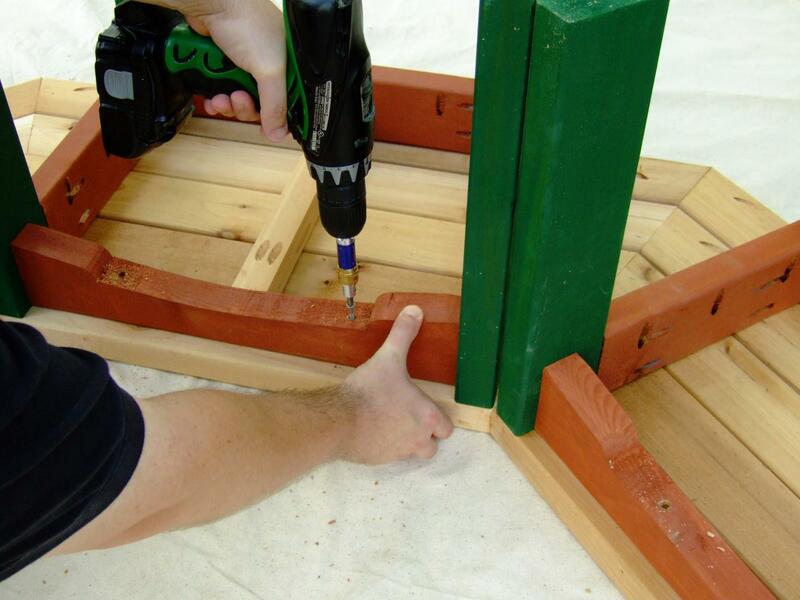 Attach pieces of side trim to the bench seat using a drill. 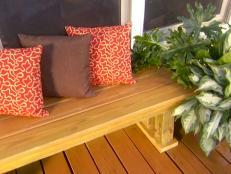 Use a ruler to evenly space the slats for your bench seats. 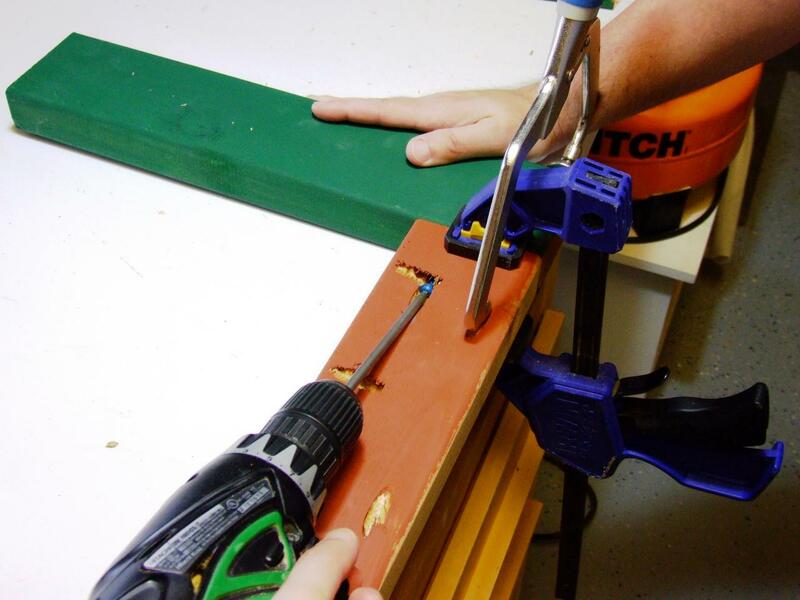 Use a drill to secure the bench slats for the top of the bench. 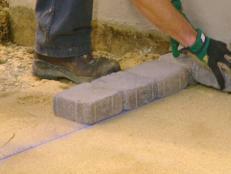 Find a large and flat work surface for the final assembly steps. Position all of the seat slat assemblies with the pocket-hole sides facing up. Place the base assemblies on top the seat assemblies and test fit. 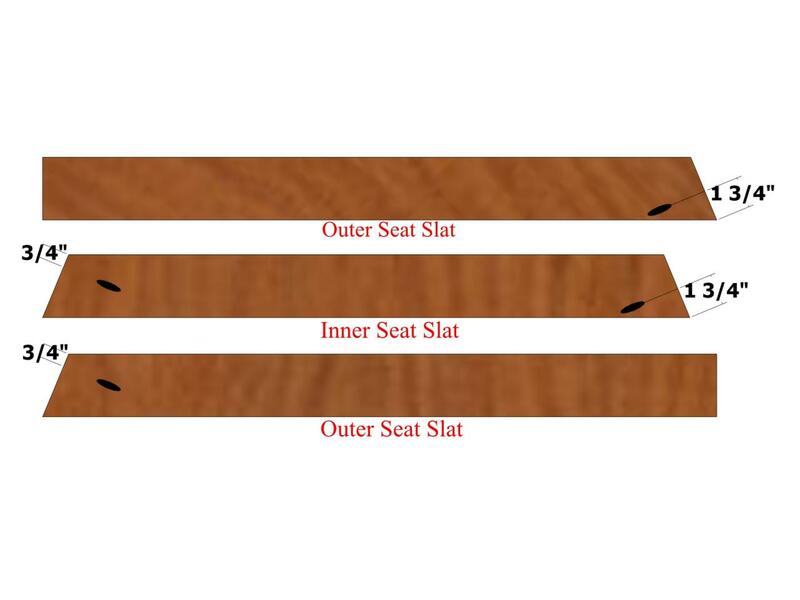 The innermost seat slat assembly should be flush with the front edges of the base assemblies and overhanging the outside edges of the side base assemblies by 1-1/2 inches. 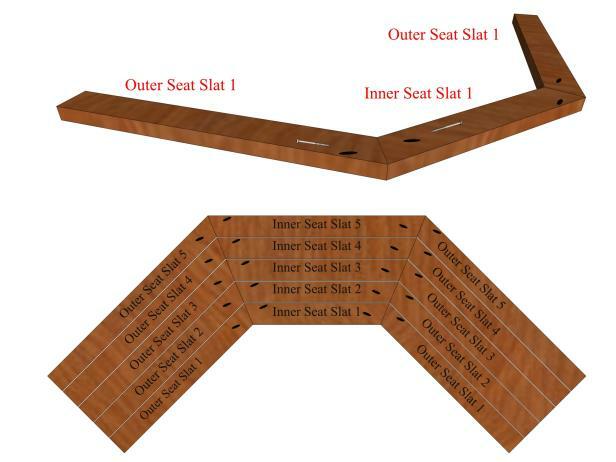 The outermost seat slat assembly should be flush with the back edges of the base assemblies and overhanging the outside edges of the side base assemblies by 1-1/2 inches. Attach the base assembly side rails and back rails to the innermost and outermost seat slats using 2-1/2" pocket-hole screws only (no glue). Drill countersunk pilot holes in the front rails and seat braces of the base assemblies positioned as shown in Image 2 (below). 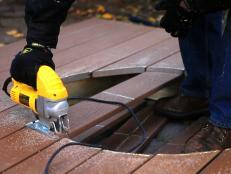 Drive 2-1/2" deck screws through these pilot holes and into the seat slats. 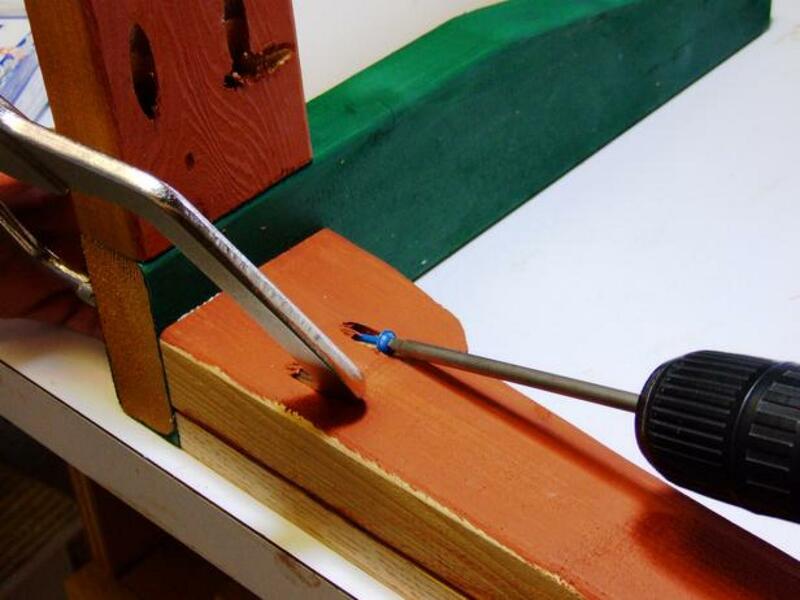 Position the remaining seat slat assemblies equidistantly apart (about 1/8") and attach using 2 1/2" pocket-hole screws and 2-1/2" deck screws. 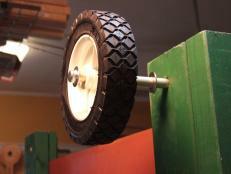 You can use a spacer from scrap wood or a paint stirrer to help with positioning the parts (Image 4). 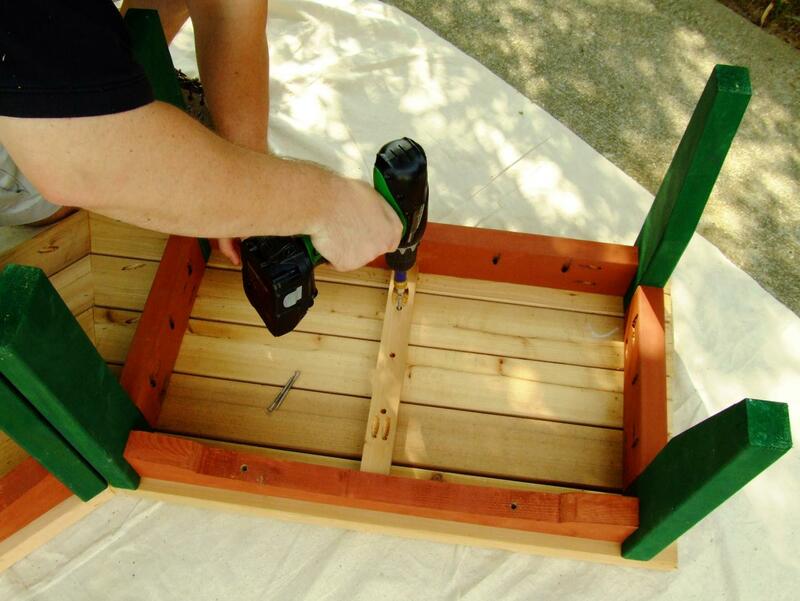 Turn over the assembly (you may need an assistant) and apply a coat of Olympic Maximum Sealer to the seat slats and touch up the base assemblies if needed. 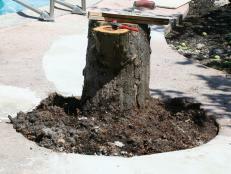 What to do with that unsightly tree stump? Don't spend the time, money and effort to dig it out, turn it into a functional piece of furniture. A garden pergola not only adds structure and style to your backyard, it will help add value to your home.